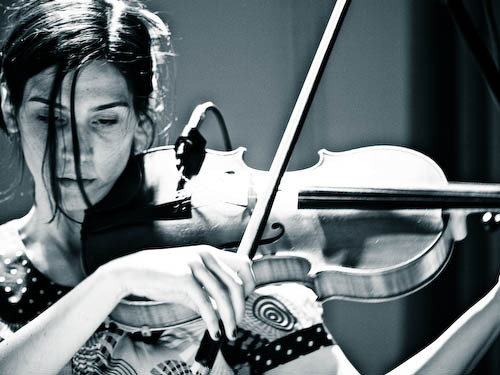 Jessica Pavone is a Brooklyn based composer/string instrumentalist that has been constantly busy since 2000 writing and performing in a wide variety of projects. Whether in her duo with Mary Halvorson, in The Thirteenth Assembly, in any number of Anthony Braxton’s tone combinations, or leading her soul group The Pavones, Jessica always brings a strong and individual approach to composition and improvisation. She has several new albums in the works, including a new one with Mary on Thirsty Ear, The Thirteenth Assembly debut on Important Records, and the first Pavones album. She is also busy composing new string quartet music for an upcoming April performance at The Kitchen in NYC. I started free improvising with no knowledge of creative or improvised music. It just happened. I started playing with a violin player. We would “talk” to each other. Then I started to learn that there was a whole world of improvised music out there. I started doing my research. Physical exercise effects my work. Physical exercise isn’t an art discipline, but it is a discipline. My practicing habits grow from my participation in physical exercise and vice versa. Film effects my work by forcing me to think of creating new worlds and fictional places which can be translated into sound worlds. Watching films broadens my imagination when I am composing and helps me dig deeper into the depths of my intuition and imagination. I am an avid fan of painting and a painter myself. Painting has influenced me creatively because it is an art form that I have never formally studied. I am not inhibited by any learned technique when I paint as I sometimes am when I work on music. I have no technique as a painter so I’ve created my own. I don’t second guess myself, because I have no expectations having never studied visual art in any way. Painting has helped me tap into pure creativity. I often compose pieces that are short and in groups or collections which fit with each other. I prefer that to composing one ginormous piece. I’ve often thought of these works as collections of poems. Pee Wee’s Big Adventure, Dirty Dancing, Godfather I and II, Fire Walk With Me, Taxi Driver, The US vs. John Lennon, Don’t Look Back, Do the Right Thing, Rear Window, The Blues Brothers. Musicians biographies and books about how we fucked up the food we eat and the world we live in. Hmm, I’m not sure what that means..